In June 24,1990 the Turtle Lake School, the Munroe Barber Shop and the Newbold Butcher Shop were officially opened as the Borden Museum. Now the museum consists of 5 buildings: the Diefenbaker Homestead replica being added in 1992 and the Masonic Lodge in 1996. In 2005 the Lodge basement was officially opened with murals from different time periods being created by the Borden School students. The barber shop and butcher shop were original buildings from Borden and members of these 2 families donated the furnishings for these buildings. Turtle Lake School had been moved to the Borden school grounds and was used as an extra classroom until 1984. There is an area in the school that depicts a 1940's classroom, and an area that tells the story of Borden's Hospital/Health Center. The Diefenbaker family homesteaded just a few miles north of Borden and a replica was built beside the Turtle Lake school. This house contains many items about John Diefenbaker and is furnished much as it would have been in the early 1900's. The Masonic Lodge, situated next to the Diefenbaker house was given to the museum in 1996. It contains a collection of toys, a 10 ft replica of the Borden Bridge, as well as pictures from the Borden Masonic Lodge and Eastern Star. We now have 5 buildings in a row that tell the story of Borden's past. The Borden Museum maintains historical records and photos of the area. This is just one of the many photos in their collection. Photo of Smith & McQuarrie General Merchants in the early 1900's. It then became Foster's Store which we now have a display for in the museum. The Borden Museum is situated on Main Street. Our displays trace the development of an agricultural community since 1900. 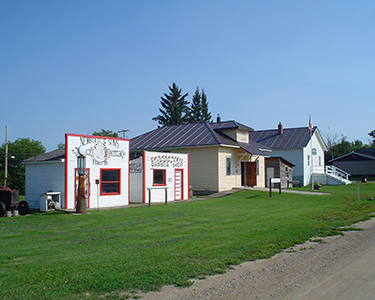 Special features include an original rural one-room school circa 1925, a replica of the Diefenbaker homestead house, an original barber shop, an original butcher shop both dating back to the 1920's, and a 1950's Masonic Lodge building. This year there will be a new display in the gallery area, featuring a handmade replica of "The Wensley Farm before Power", as well as other items from that time period. Suggested tour time is 2 - 2.5 hours. There is no charge. Karen Kerr 306-997-5600 to book a tour date.